Over its 49-year history, Talladega Superspeedway has been called NASCAR’s longest, fastest, and most competitive venue. But the track isn’t the only thing spectacular about Talladega. If you’ve ever attended an event here, you know that the Talladega tailgating experience is just as amazing and energetic as the action on the track. But, it’s about to get even better. For the 2018 season, Talladega Superspeedway is introducing a brand new premium tailgating lot called “The Compound.” It’s not a campground, and there are no RVs allowed. This new family-friendly attraction is designed for fans who want to live the Talladega tailgating experience on race days, but the lot is only open on race days, before the action starts. Wrist bands are required for access to The Compound. It’s gated, with attendees on duty during open hours. You can reserve a spot through the Talladega Superspeedway ticketing office. There are more than 90 spots in the Compound – some paved and some gravel. At 15-feet wide by 25-feet long, the oversized spots offer plenty of room for grilling and gaming. And reservations are good for the entire weekend (Friday, Saturday, and Sunday) at the spring tripleheader weekend. When you reserve a spot at The Compound, you receive admission wristbands for six people. Spot holders have the option to purchase up to four additional wristbands – for a maximum total of 10 people per spot. 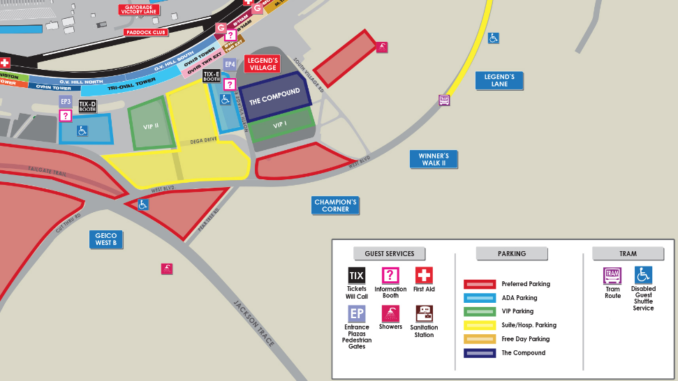 If you don’t have a spot reserved in The Compound, you cannot purchase a wristband, so only spot holders and their friends will be allowed onto this exclusive lot. The tailgating experience at Talladega is legendary. But you should expect a more tempered scene within the gates of The Compound lot. While most traditional tailgating activities are welcomed and encouraged, there are some rules in place to ensure that the environment inside The Compound remains safe and family-friendly at all times. No overnight camping is allowed. Only one vehicle is allowed per spot – and all vehicles must leave the lot at the end of each day’s event. Smokers, grills, tents, canopies, and electronics are allowed. Sound systems must be kept at moderate volume, and generators must be quiet and produce no harmful fumes. No pets are allowed on The Compound lot – and at least one person at each spot must have a ticket to the day’s Speedway event. The goal of the additional regulations is to create a family-friendly alternative to the traditional Talladega RV campgrounds. Speedway management is hopeful that the new lot will open up the Talladega tailgating experience to families and fans who want to tailgate, cook out and celebrate the racing events in a low-key and quieter environment. We were excited to learn about the new Compound tailgating lot at Talladega. Here at TGSM, one thing we have demonstrated again and again across the world of sports is that women and families love to take part in the tailgating experience… as long as their needs are not ignored. For women, especially those with families, the unsanitary and unwelcoming experience of traditional porta potties can be enough to keep them away from tailgating parties. And while this problem has been overlooked in the past, venues from many different sports are beginning to realize how much this seemingly simple problem can impact their bottom line. Women are more likely to purchase high-end foods and beverages. They are more likely to share their experience on social media. They are more likely to recruit other friends and family members to come along for the event. And when women decide to purchase gear and apparel – they often decide to purchase items for the whole family! We’ve found that most venues are quick to rectify this problem as soon as they become aware of it. When a venue’s management team understands the true cost of cheap porta potties, it doesn’t take them long to seek out a better solution that makes women feel safe, warm, and welcome at their tailgating events. TGSM’s mobile activation assets are specifically designed to provide an ideal tailgating experience for women and families – and people are shocked to learn about the huge immediate impact they have on attendance and duration-of-stay statistics for women at tailgating events. Our units provide the most luxurious, sanitary, and state-of-the art restroom services available on any tailgating lot today. With full-size authentic China toilets, locking privacy doors, hot water handwashing, oversized glass mirrors, and four-season climate control – women no longer fear the tailgating lot… they actually look forward to the next event! And it doesn’t take long for them to spread the word about their great experience through social media and word of mouth. The capabilities of our high-tech tailgating assets extend far beyond the luxurious restrooms they provide. We provide a free high-speed wireless data network that draws in families and millennials. And we keep the most active and engaged fans nearby for the duration of the event with more than 50 digital screens, two high-definition video walls, a stereo broadcast sound system, interactive games, and much more. Throughout their engagement with our mobile assets, your fans will receive opt-in opportunities for several different channels – allowing you to harvest a wealth of actionable data that can be used to open and expand untapped revenue streams within your existing fan base. If you’d like to learn more about how TGSM’s mobile brand activation units can help you to attract and retain women and families at your tailgating events, give us a call today at (888) 995-2285. I just came back from the race this past weekend and I had purchased one of these new Compound spots. There were no bathrooms as stated above, not even any garbage cans. Nothing but a plain ole parking spot….